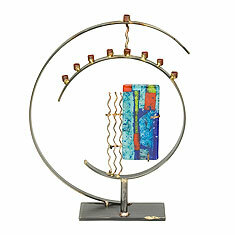 Gary Rosenthal has been sculpting in welded metals for almost 30 years. Together with a team of talented craftspeople, he creates one of the most popular and unique lines of Judaic art in the country: The Gary Rosenthal Collection. Combining copper, brass, and steel with brilliant fused glass, the collection has a contemporary style rooted in tradition. Inspiration comes from the rich history of the Jewish people, which tells us it's a blessing, a mitzvah, to make beautiful functional art.